What’s the big deal you may wonder? After all, a good translation already re-shapes a text at the cultural and linguistic levels. However, transcreation goes a step further. It requires that the translator become a cultural expert, sensitive to the audience’s emotions, needs and cultural backgrounds. 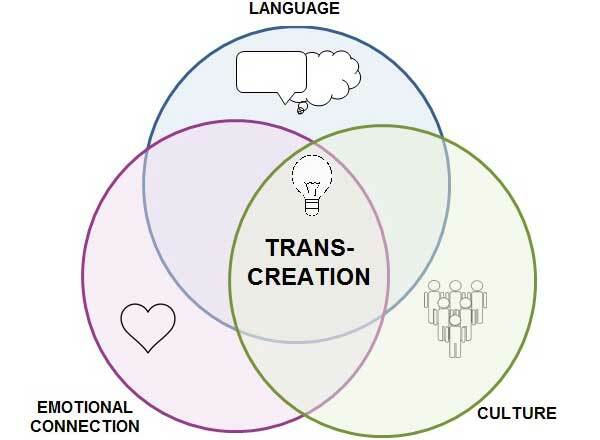 Transcreation enhances the translator’s creativity and capacity to tailor the message to the specific target audience. The important question here is how close the transcreated message comes to the target audience’s needs. At USAGov en Español (formerly known as GobiernoUSA.gov) we create original content, but we also transcreate; two recent pieces of content are good examples of us exercising transcreation. USAGov recently published “Bouquets and Bruises: This Valentine’s Day, Help Someone Experiencing Abuse.” Such a delicate topic, not only posed challenges to the writer, but for the Spanish transcreator. The intention of this feature was to raise awareness about physical and emotional violence on a day many people consider to be the most romantic day of the year. In order to maintain the same emotional responses in the target language, the cultural references to Valentine’s Day, although traditionally not so prevalent in the Hispanic world, were kept in the Spanish version. (Not saying that Hispanics aren’t romantic, we also call it “Friendship day!”) However, the piece in Spanish diverted from the original text when it directly addressed the fear that immigrants have of being deported if they report abuse. The text highlights the resources available to them regardless of their status. Finally, there was a paragraph on college safety which was replaced by community safety. It offered resources to empower individuals that want to speak out when they know of or witness abuse or domestic violence in their workplace or where they live. The upcoming feature “Discover Six of the Government’s Best Mobile Apps” posed a different set of challenges. Research shows that the Hispanic community relies on their smartphones to access information and over index on mobile use, so this presented an ideal opportunity to offer these useful government resources. Unfortunately, only a few apps are available in Spanish. After spending a considerable time and effort researching possible counterparts, we decided to include mobile sites that are available in Spanish, and rename the feature “Descubra lo que el Gobierno le ofrece a través de su teléfono inteligente” or “Discover what’s available from the Government using your smartphone.” The resources were selected from a bigger pool of options based on the most prevalent interests to the Hispanic community: food safety, consumer protection, and health issues. In both cases, to avoid losing impact with a mere direct translation, and still resonating with your intended audience, USAGov en Español purposely transcreated the features and solved the issues of cultural sensibilities and resource availability. This takes time and care, but renders results if you take the time to do it and you have an integrated bilingual and bicultural team that understands the needs of the audiences you’re trying to reach. This post was originally published on the USAGov blog by Andrea M. Castelluccio, a bilingual member of the USAGov content team.